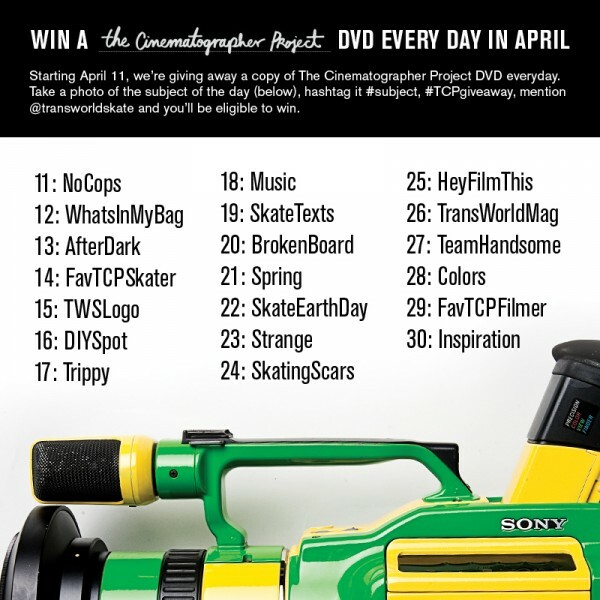 Win a The Cinematographer Project DVD every day in April with Instagram! Starting April 11, we're giving away a copy of The Cinematographer Project DVD everyday through Instagram. Take a photo of the subject of the day (below), hashtag it #subject, #TCPgiveaway, mention @transworldskate and you'll be eligible to win. Entries will be judged on creativity. You can enter more than once for each topic. You must be following @transworldskate on Instagram to win.